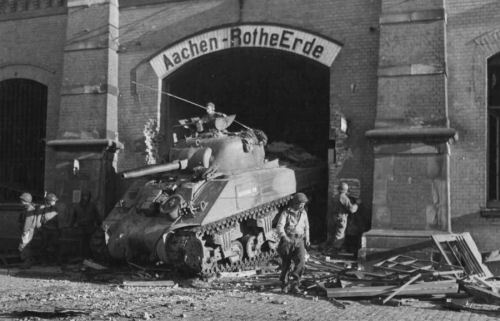 The activities of the 26th lnfantry Combat Team during the historic month of October 1944 fall into three distinct phases: the initial period of probing enemy defenses and patrolling of the outskirts of Aachen; the attack upon and the systematic reduction of enemy strongpoints in Aachen which brought about the surrender of the German garrison; the reorganization and employment of the regiment in the sector north of the city. Enemy tanks had been reported near the railroad tracks on the western and southern edges of town, and 3rd Battalion patrols were sent out to verify this so that an artillery barrage could be laid in on the spotted enemy vehicles. The patrols returned with the information that the Germans had withdrawn the tanks, and that enemy activity was centered on keeping close to pillboxes and houses in the outskirts of town. Preliminary reports had it that two regiments of the 246 German Division had the mission of defending Aachen. German soldiers had been given the task of clearing out the civilians who had remained; 15,000 German civilians were still reported in town, and in the extreme measure to force the rest to evacuate, two civilians had been reported hung by the military authorities for refusing to leave. As yet the gap up north was sufficiently open for the German garrison to receive equipment and supplies, and this was judged, evidentially, open enough to ensure the evacuation of all nationals to the interior. Throughout the day, there was little out of the ordinary. Through patrols, and observations of the OPs, harassing fire was laid on all night on targets in the vicinity of Steinebruck and Burtscheid. Tanks reported moving out through Haaren were taken under fire at 2145 hours. Plans were discussed at the CPs, with both 2nd and 3rd Battalion commanders called in to receive the preliminary study plans and go over plans and go over the sectors to which each had been assigned. Ammunition restrictions were also revealed to the battalion commanders so that there would be ample time to work out the employmemt of all possible weapons for which ammunition stocks were available. "K" Company patrols illustrated how tightly drawn the lines were between friend and foe. A patrol working through the "K" Company lines came upon German mortar positions barely 400 yards from their own lines. An attack by the tiny patrols to put the enemy weapons out of action was frustrated by the unusually strong guard at the mortar positions, and the patrol returned with the coordinates of the positions which were placed under heavy fire, from captured German mortars which were manned by 3rd Battalion crews. There were two enemy ruses that failed to work on this day. P-47s were given the mission of bombing a target NE of Aachen. Directed by our OPs, artillery marked the target with red smoke. The Germans then threw blue smoke on that and other points to confuse the planes. Red smoke shells were however fired on the target once more and the planes then bombed successfully. The other enemy ruse had as much success as the first. About ten o'clock at night, the enemy attempt revealed the limits to which the Germans were ready to go in their propaganda efforts to slow up our attacks. Opposite the "K" and "I" Company posts, a German PA system was set up and some swing music played, with up-to-the-minute selections of popular tunes played by such bands as Benny Goodman, Artie Shaw, Duke Ellington, and sung by Frances Langford, Dina Shaw, and Martha Tilton. Then in excellent English, the German announcer talked about the States, and the good times to be had back there. Every effort was made to induce homesickness to listeners, to convince the listeners that the Allies were fighting a losing war: Russia will gain, and the British will gain, and Americans will have only debts and casualty lists to show. New York City was being systematically reduced by the Luftwaffe, and other great American cities were already in ruins or would soon share that fate. Music was then played, followed by the announcement that it would be an excellent idea if the Americans let up on the shelling, and allowed everybody to have a good night's sleep. The 3rd Bn. crews at the German mortars then fired a concentration upon the German positions and that ended the broadcast. Shortly after midnight, there was the sound of heavy mortar and small-arms fire to the north of Aachen. The enemy was attacking "A" and "K" Companies, 16th Infantry. "A" Company, 26th Infantry reinforced by a section of MGs from "D" Company was alerted to move to the 16th lnfantry sector and remain in reserve, to be used only upon Division orders. This force moved within a half-hour after being alerted. 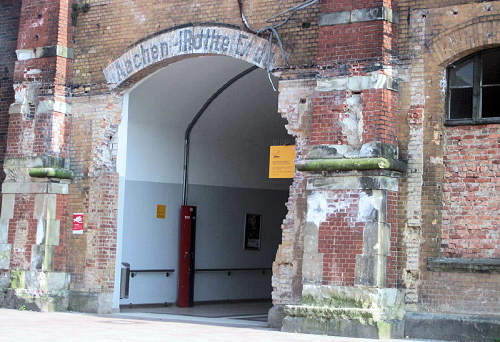 Meanwhile patrols from both the 2nd and 3rd Battalions worked to the railroad north and south of Rothe Erde, but did not encounter any enemy patrols; The 2nd Battalion on its return to battalion lines ran into a trip wire which set out explosions and drew machine-gun fire from along the track at 867428.
of the train station of Aachen - Rothe Erde. October 1944. 1st Battalion called Major Clisson and informed him at 0840 hours that "A" Company was returning to their control, since the 16th Infantry had succeeded in repelling the enemy thrust, and in retaking the ground lost in the initial fighting. The German infantrymen had been supported by half-tracks and flame throwers in the attack against "K", 16th Infantry positions. Harassing fire was laid on targets north of Aachen, and on Burtscheid. A 3rd Battalion patrol worked into the town as far as the hospital near Observatory Hill before it was forced to return after running into a German patrol and beating off the enemy in a firefight. 2nd Battalion patrols probed the southern and eastern edges of town, locating AT gun positions, OPs at the Capitol Theatre, minefields and machine-gun and machine-pistol positions. A civilian reported that there was an enemy OP at church northeast of Burtscheid. Artillery fire was placed on all these points. "L" Company area received heavy 120mm mortar fire. 3rd Battalion patrol activity had established that enemy defenses in the vicinity of the three hills north of Aachen, Observatory, Salvador and Lousberg Hills, were particularly powerful, and photographs were called of this area. It was quiet during the day and evening, but towards midnight, "L" Company again received 120mm mortar fire. A 2nd Bn patrol passed through "L" Company lines. It reported that enemy outposts were withdrawn during the day and then reposted at night in the sector facing the 2nd Battalion. Major Shutt, VII Corps, Assistant Chemical Officer, with two assistants, arrived at the CP and inspected gas masks at the battalions. It was their opinion that if the enemy was to use gas at all, it would he possibly at the Rhine. General Huebner called Colonel Seitz and outlined the plan for setting up a recreation center back, of the rear echelon elements where the men could go on 24 hour pass and enjoy a good night's rest, good food, hot bath and entertainment. 1% of the command could go each day. Maps of the Aachen area were sent down in the afternoon, and the battalion commanders again reported at the CP to look these over and discuss at further length the plans for clearing the city. 2nd and 3rd Battalion patrols returned from afternoon patrols thru the outskirts of Aachen, reporting enemy locations and positions in the areas, Burtscheid, Forst and Rothe Erde which were placed under artillery fire. A large explosion followed the firing on a target at 828430; judging from the amount of smoke, a gasoline and ammunition dump had been hit. From a PW of the 2nd Co., 1043 Volks Regiment came the statement that many in his company would like to surrender but were afraid of being caught and shot for desertion. Another PW reported that an enemy Bn CP was located in a monastery in the western suburbs of Aachen. (825427). Throughout the day, patrols sent out by the two battalions were to clash with enemy patrols. Artillery fire was placed on the the NE corner of Aachen, that triangle of buildings near Lousberg Hill that was to prove troublesome later on in the drive. At 2040 hours Colonel Evans called Colonel Seitz, and outlined the plan of having Lt Boehme, MII officer attached to the 26th CT. and Lt. Lafley, S-2 proceed under flag of truce and present the commander of the Aachen forces with an ultimatum to surrender the town before it would be destroyed in the fighting. Bombing to the NE of Haaren was done in the face of intense German AA fire. While the 18th Infantry attacked north of Aachen, "L" Company, 26th Infantry moved out at 0400 hours and attacked the area of Brandenhof, the suburbs south of Aachen. In the darkness the company moved through to its objective, and then as the light came discovered that enemy strongpoints in houses had been bypassed in the darkness. Holding its advanced positions 700 yards from the railroad, the company worked back and cleaned out the houses one by one. It was time-consuming, but it illustrated to the battalion commanders just what lay ahead in painstakingly and thoroughly clearing each house, and each room in the house. "F" Company worked out at 1330 hours towards the railroad tracks below the town, and it too proceed slowly in its advance. Engineers found a streetcar and proceeded to contribute their bit to harassing the enemy. 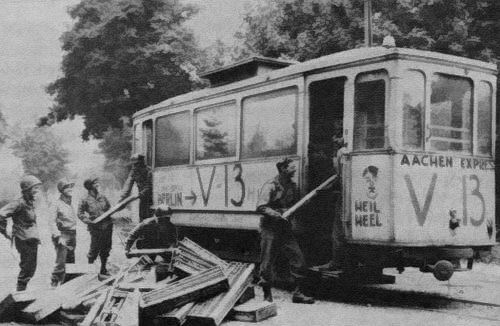 Loading the streetcar with explosives, a big sign was tacked on the car, "V-13", and the loaded vehicle sent at top speed into the city, where a tremendous explosion was soon heard. These same Engineers were detailed to blow up a ten-room bunker at 857390, which was accomplished successfully. german grenades of 75mm and 88mm caliber. an allusion to the german wonder weapons V 1 and V 2.
detonated without causing to much damage as it was told. PWs indicated that reinforcements were still coming in from the gap north of Aachen, which was steadily being narrowed by the units assigned sectors above the town. The enemy attacks were designed to keep this route open.